If you want something as a "ta- da" dish -- a centerpiece that's not meat, I've got some dishes to consider. First, think of the all the sides that we love. Many or most of them don't require any meat or meat stock to be crowd pleasing. People love stuffing and gravy. Why not do leek-mushroom-herb stuffing in muffin tins and a mushroom gravy? No bones and no griping. 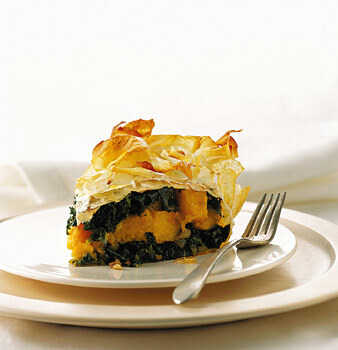 For an elegant centerpiece dish: try the Kale Butternut Squash Phyllo Pie made in a springform pan. Elegant and beautiful with bright colors and crispy phyllo. Try cashew cheese and skip pancetta (or use porcinis for umami), use Earth Balance butter substitute and you're meat-free, dairy-free. Another of Kim's recipes that even carnivores have asked for in subsequent meals: the Lentil-Chard Shepherd's Pie. The sage butter sweet potato- white potato casserole (below) is easy to make dairy-free and if you use gluten-free bread, it can be GF, too. Again, your potato ricer is your friend. Light fluffy potatoes get mixed with browned sage butter and topped off with fresh breadcrumbs. I modify Martha's recipe and make it dairy-free and delicious. Another dish that is a real favorite, I've taught it to Kitchen Confidence clients and they adored it. I love it. Red rice pilaf stuffed Delicata squash. The recipe is from Kim O'Donnel's Meatless Celebrations. It's colorful, delicious and substantial enough to use as a vegetarian/vegan main course. Both of these could certainly be main courses for a meat-free meal that won't leave you wanting. What is that divine scent? Clafoutis, Clafouti "cla-foo-TEE"! So fun to say, this French dessert is making converts of us all. A baked custard with fruit is about the closest description that works. Trust me, it's fast, delicious and will quickly become a regular in the rotation. A girl has to eat something besides oysters. Balanced diet and all, I’ve been pretty lucky in the food department lately. From the ten pounds of cucumbers gift, to oysters, to Dungeness Crab, to lobster feasts, it’s been a great run. The first nectarines of the season and another delicious pint of blueberries had me thinking about crostata, tart, crumbles, cobblers...then a colleague of Doc’s gave us a gift of farm fresh eggs, I decided a clafoutis was in order. Or is it a clafouti? Who knows, maybe some early French roofer's wife decided it looked like a shingle studded with nails? I just love these word mysteries. Technically, if not made with cherries as it is in Limousin (the traditional clafoutis is made with un-pitted cherries!) the dessert becomes a flaugnarde. Clafoutis is just more fun to say, ne c'est pas? Once we've settled on the etymology, the next step is finding a recipe that doesn’t call for heavy cream and figuring out how to make a dairy-free version of the dish that’s just as tasty. Denise at Chez Us has this gorgeous baby: Gluten-free Cherry Clafoutis. She goes traditional with pits in. Using the ever-handy EatYourBooks.com, I scour my cookbook collection in a fraction of the time it would take me to pull books one by one. I find that Romney Steele’s Plum Gorgeous has a recipe, as does Yvette Van Boven’s Home Made. Julia’s got one in The Way to Cook but it places the clafoutis in a pastry shell. I settle on Joanne Chang’s Flour cookbook. Its recipe is simple, doesn’t call for heavy cream and comes with a lovely story in the headnote. God I love cookbooks. So with gratitude for all the cookbooks I reviewed, and re-loved this morning, I bring you my clafoutis. Thanks to Brigit Binns (AKA the Roadfoodie) for the roasting suggestion. Note: this flaugnarde/clafoutis ended up a little too sweet for my taste though others declared it “perfect”, “delicious”, “amazing.” If you like things sweet, do as is. If you prefer less sweet, I think you could reduce sugar and/or vanilla a bit and it would be fine. You could also omit the Cointreau. One thing we can all agree upon: clafoutis is just a fun word to say. Clafoutis is also a good way to use fruit that might be just a tad past its prime, as the baking and the custardy blanket hide the odd bruise or blemish. Try to use the best fruit you can though, save the really soft stuff for smoothies. Preheat the oven to 375, convection roast or bake. Wash, pit section nectarines. Make cleanup easier by covering a small cookie sheet with foil. Drizzle nectarines with Cointreau and roast just until edges begin to caramelize. You could also skip this step but I think that roasting does make the flavor deeper or richer. Remove to a bowl to cool. While nectarines are cooling, position rack to center of oven and set to 400 bake. Measure other ingredients. Melt butter in microwave safe bowl or ramekin at low power for a minute. Pour butter into 13x 9x 2 baking dish. In medium bowl, toss fruit with half the sugar and the lemon zest. Toss gently then turn into the buttered baking dish. Using same bowl (why dirty another?) whisk eggs, then add remaining sugar, flour, salt. Whisk in (enriched) milk, vanilla and orange flower water. Pour whole shebang over fruit and bake for about 45 minutes. It will puff up and turn golden brown around the edges, and should remain somewhat jiggly in the middle. Dust with confectioner’s sugar (a tea infuser works really well) slice and serve. In this photo, you can see that the clafoutis begins to sink pretty quickly. Not to worry! It is delicious anyway. Fear not the flaugnarde! Allons-y! Come enjoy a clafoutis.